In today's Tech Tuesday, Jerry will be giving you a sneak preview of what's to come in the new ClareHome v6.0 release! Next week, we'll be answering your questions about the new update. Be sure to ask them here by submitting our form. You can also fill out our survey for a chance to win a ClareVision Plus 2MP Cube camera! More details inside. 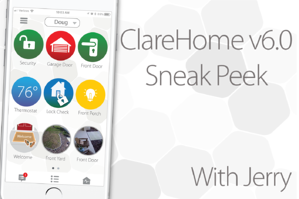 Lets tune in with Jerry as he gives us a brief sneak peek at some of the new ClareHome App screens and features that are coming up! Do you have questions about the new App update? Concerns? Next week, we'll be answering your questions. Click on the link below and submit a form. Also, be sure to fill out our survey to see if you can be the next winner of one of our Cube cameras!